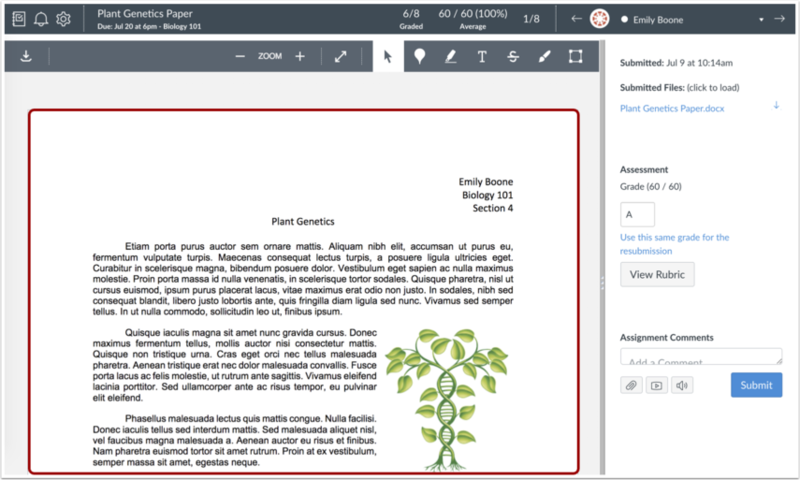 SpeedGrader makes it easy to evaluate individual student assignments and group assignments quickly. 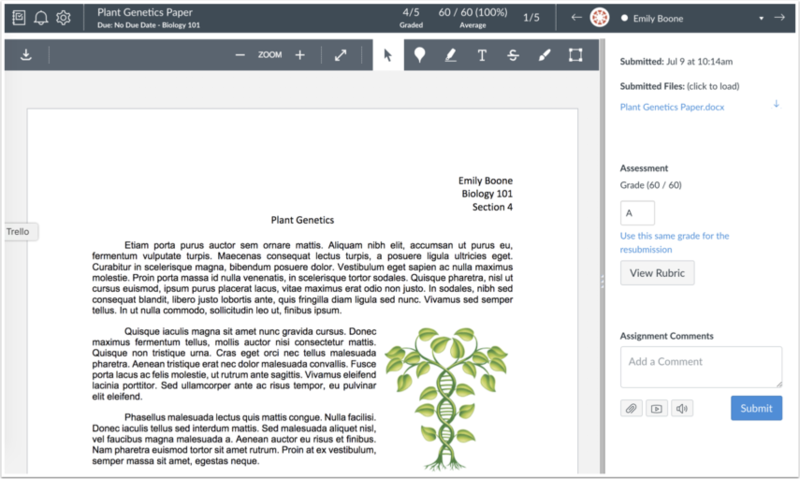 SpeedGrader displays assignment submissions for active students in your course. However, SpeedGrader displays assignment submissions according to the current Gradebook settings for inactive enrollments and concluded enrollments. For instance, if the Gradebook settings show inactive enrollments, inactive student submissions also appear in SpeedGrader. You can access SpeedGrader through: Assignments, Quizzes, Graded Discussions, and the Gradebook. In SpeedGrader, all values for an assignment are loaded and saved in the browser, including student submission data, any grades (including original grades for resubmitted assignments), rubrics, and comments. This behavior reduces load time while using SpeedGrader, allowing instructors to grade all submissions quickly without continually refreshing the browser. Advancing from one submission to the next does not dynamically load any updated content. In large courses, SpeedGrader loading times are affected by a threshold of data points that can be loaded within a 60-second window. This threshold is based on a single submission per student. Multiple submissions by the same student increases the submission threshold. 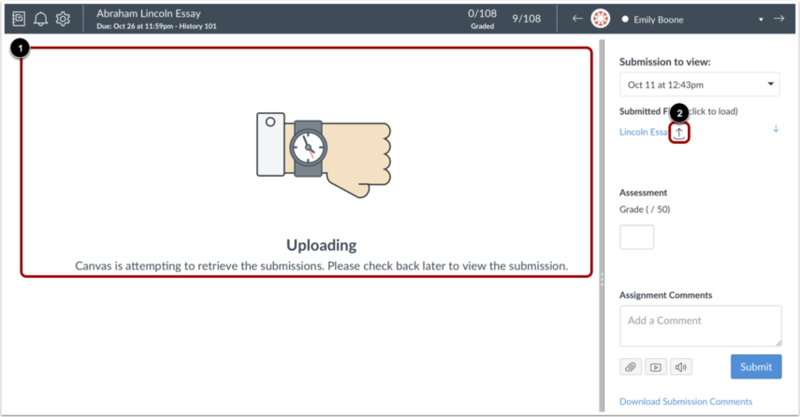 Assignments with more than 1500 submissions may result in delayed SpeedGrader loading times, and assignments with more than 2500 submissions may fail to load at all. To improve SpeedGrader performance, large courses should be separated into sections, which allows SpeedGrader to display submissions for a specific section and decrease the overall loading time for an assignment's data. SpeedGrader is generally designed for one instructor role to grade submissions at a time. Because of how SpeedGrader data is loaded and stored in the browser, multiple users should not grade assignments at the same time since each grader cannot view the most recent information for a submission. Updated grades also affect the Gradebook. 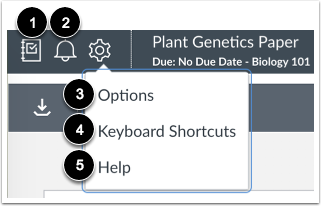 If your course includes multiple graders, graders added to a course can be limited to only interact with users in a section and only grade submissions in the section where they were enrolled. This enrollment option prevents assignment grading overlap so multiple instructor roles cannot grade the same assignment. If you are grading a moderated assignment and the maximum number of graders has been reached, SpeedGrader will be displayed in a read-only mode to hide all student names and submission details. SpeedGrader includes several areas to help you locate and view student submissions, grade submissions, and add comments to submissions. The SpeedGrader menu includes several tools and resources to assist with grading assignments. The left side of the menu includes general settings and options. To return to the Gradebook, click the Gradebook icon . To mute or unmute the assignment from SpeedGrader, click the Mute icon . Options , which allows you to select student list sorting options and enable anonymous grading. Help , which opens the Canvas Help menu. The help menu icon matches the help icon set by a Canvas admin, so icons may vary across accounts. Note: When moderated grading is enabled for an assignment, final graders (moderators) will also view a Moderation Page button, which will allow them to view the Grade Summary Page for the moderated assignment. The center of the menu bar includes assignment information and overall grading information. Assignment information includes the name of the assignment , assignment due date , and the name of the course . To view the assignment details, click the name of the assignment. The assignment details page also lets you download all student submissions for the assignment. To return to the Course Home Page, click the name of the course. Grading information includes assignment statistics, including the number of assignments that have been graded out of the total number of submissions  and the average score and percentage . You can use this information to keep track of your grading progress. The right side of the menu bar includes the student list for the assignment. SpeedGrader opens the assignment for the first student listed in the student list, arranged alphabetically by last name. If you have activated student view, the Test Student will be shown at the end of the student list. The student list also displays the status of each student's submission. You can also use the student list to find student submissions. Once you have selected a student, the student's submission displays in the preview window. Depending on the assignment and submission type, the SpeedGrader preview window may vary. For example, a website URL submission type will appear in the main body of SpeedGrader with the option to open the URL in a new tab. Some website URL submissions cannot be viewed in Canvas and must be viewed in a new tab. Media submissions may display as an embedded file in SpeedGrader or only display as a downloadable file. Use Canvas DocViewer to mark up .pdf, .doc/.docx, and .ppt/.pptx assignments directly in SpeedGrader. SpeedGrader may take up to ten minutes after an assignment is submitted to display a document that supports DocViewer. Download the submission, put feedback on the document, and re-upload the submission. If a Google Drive or Microsoft Office 365 assignment upload is queued for submission, an Uploading image displays in place of the student submission . An Uploading icon also displays next to the assignment link . When a Google Drive or Microsoft Office 365 assignment submission fails to upload, or when viewing an unsupported file type in SpeedGrader, an Upload Failed image displays . Failed submission uploads display an Upload Failed icon next to the assignment link . SpeedGrader displays assignment submissions according to the current Gradebook settings for inactive enrollments and concluded enrollments. If an assignment includes a submission from an inactive or concluded student, a notice appears at the top of the SpeedGrader window. For group assignments where students are graded as a group, the group displays as long as there is at least one active student in the group. If there are no active students in the group, the group displays if one group member aligns with the enrollment settings in the Gradebook. 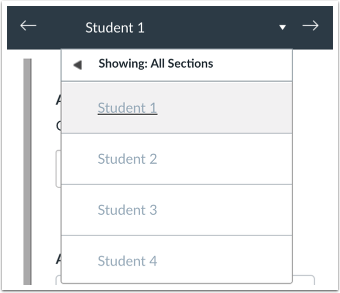 For group assignments where students are graded individually, individual student submissions display according to the enrollment settings in the Gradebook. Inactive student submissions can still be graded in SpeedGrader, but students do not receive any notifications about their assignment and cannot view course grades. Concluded student submissions are read-only; they cannot be graded or receive comments. Note: If a student does not have a submission for the assignment, the student may have been deactivated or concluded before being able to submit the assignment. If your course uses multiple grading periods, a notice appears at the top of the SpeedGrader window if an assignment is in a closed grading period. Assignments in a closed grading period cannot be edited. The SpeedGrader sidebar provides all the submission details for the student shown in the student list. However, submission details are not shown when an assignment is graded anonymously. View the submission details , including as the date and time of the submission; if an assignment was resubmitted, you can view previous versions of the submission. You can also download the submission file by clicking the link . Complete the assessment of the submission by entering a grade or using a rubric for grading, if available . Leave assignment feedback comments for the student in the comments section . Assignment comments also display as a new thread in Conversations. 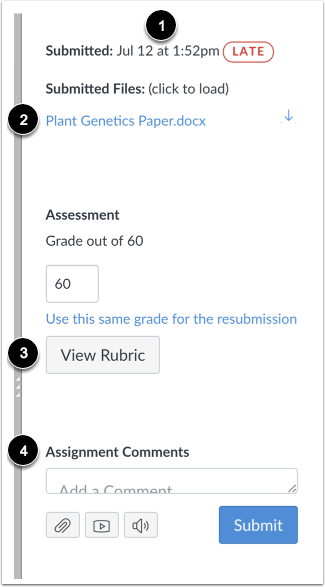 Once you grade the submission, the student's assignment indicator changes to a check mark, indicating the submission has been graded. You can view the next student's submission by clicking the arrow button next to the student list. 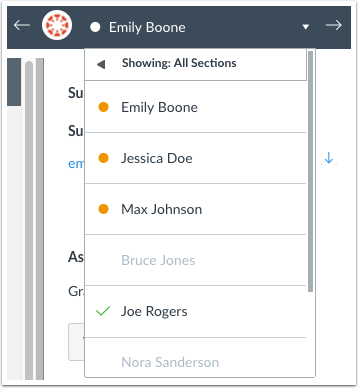 When evaluating group assignments, the student list displays the name of each group, unless the group assignment is graded individually. Evaluating group assignments is the same process as individual students. You can mark up documents directly or download them for feedback, enter grades and view the rubric, and post and view comments. Learn more about grading group assignments. If an assignment was set to be anonymous, the student list displays all student names as anonymous. The student list order does not match the order in the Gradebook and is randomized for each assignment. If an assignment is not anonymous, you can enable anonymous grading in SpeedGrader to hide student names at any time. Previous Topic:How do I get to SpeedGrader from an assignment, quiz, or graded discussion? Next Topic:How do I use the student list to view student submissions in SpeedGrader? Table of Contents > SpeedGrader > How do I use SpeedGrader? It would be great if this guide showed what it looks like when there are multiple submissions to an assignment. Since this is more of an overview lesson, we do note that you can view multiple submissions (in the step entitled "View Sidebar") and then provide a link to a more in-depth lesson that shows how to view submission details, including how to view multiple submissions. That lesson is linked in the step I mentioned above, or can be found here: How do I view the details of a submission for a student in SpeedGrader? I hope that helps! I wanted to follow up with you and make sure we were able to address your feedback. If you ever have any questions or feedback in the future, please don't hesitate to reach out. We're here to help! If we don't hear back from you on this thread, we'll be archiving these comments in a few weeks. 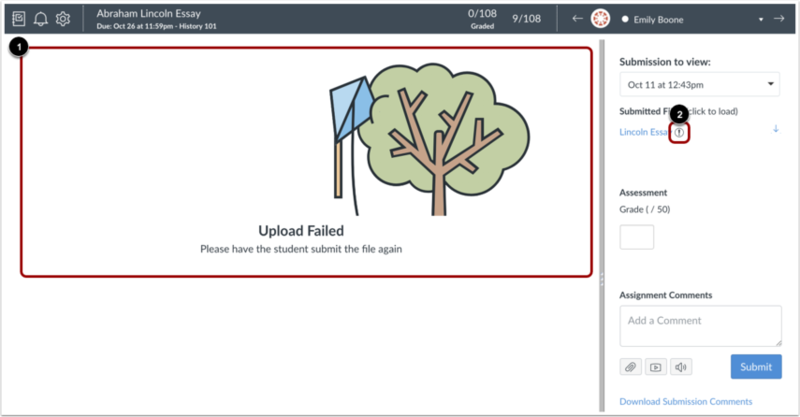 The message "Upload Failed Please have the student submit the file again" is misleading if you require the students to upload a file that isn't supported by DocViewer. Shouldn't the message be something that says what really is the case? What about "SpeedGrader/DocViewer cannot display the uploaded file. Please download it on the side-panel to the right"? Upload Failed is just plain wrong because the file still got submitted properly. Being a long-time Canvas user, I've lived with this for as long as this message display became part of SpeedGrader just because I know the file type for what I require of my students and I can still grade the work they submit. (For instance zip files containing code). But for someone new to Canvas and SpeedGrader it makes them worried that their students' work didn't get submitted properly. Anyhow this isn't a documentation error, but a suggested feature enhancement to make it more clear to users of SpeedGrader. I've submitted a Feature Idea for this in case anyone is interested in seeing this adjustment. Thanks for sharing your thoughts and the feature idea you created. You're definitely on the right track to encourage this change in Canvas by creating a Feature Idea. If you have any questions or concerns for us, please let us know.